The third generation of Twitch Plays Pokemon has kicked off, and this time, the trainer is a girl. 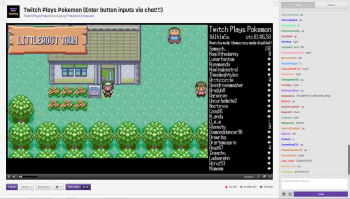 Last week, Twitch Plays Pokemon managed to defeat the second generation of Pokemon games: Pokemon Crystal. After a considerable delay, the stream has now resumed, this time with Pokemon Emerald, from the third generation of Pokemon games. Also, this time, Twitch has managed to pick the female trainer, giving her the nickname, "A". While viewership faltered a little with Pokemon Crystal, Emerald seems to be drawing in some crowds again (at least at the start), with the current viewership hovering around 30,000 "players". Still a far cry from Pokemon Red's 100k+, but still pretty impressive. The stream's creator says that no romhacks or codes are being used, though here's hoping he has inserted some custom content into the game, like how the Red we faced in Crystal used the same team from Twitch Plays Pokemon Red. Check out the stream right here.